Star Wars Rebels is exciting for a variety of reasons. It’s our first new look into the ever-expanding post-Disney-buyout universe of the beloved space opera franchise. Second, it’s a good time, capturing the look and feel of the original franchise. And third, it’s about to give us our best look at Darth Vader in quite a while. Better than that, James Earl Jones is returning to voice the iconic villain for the first time in years. What? You still need more than that? 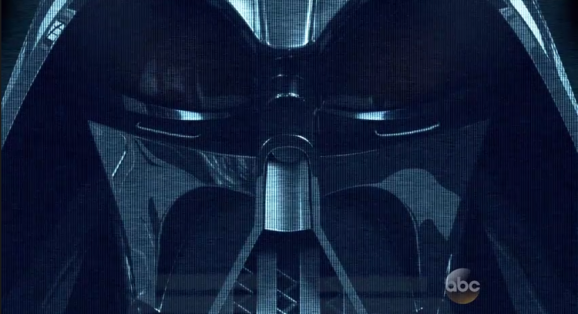 How about this: here’s your first short glimpse at the Sith baddie. We’ve seen an image that appeared a while back, but this is the first footage of Vader’s return. Admittedly, this isn’t much of a look, and you don’t really get much beyond a looming head and some deep breathing. Still, that’s not bad. And it may be enough to get you giggling just a little bit, similar to a kid on Christmas morning when you spy your first present. This isn’t something that will appear in new episodes of Rebels. Instead, this moment is an addition to the premiere “movie,” “Spark of Rebellion,” that airs on ABC on October 26. According to reports, this scene is an addition designed to flesh out the series villain known as the Inquisitor. He shows up at the very end of “Spark,” but there’s not much done with him. And it looks like this plays out much like we expected it to, with Vader appearing via hologramatic message rather than actually being anywhere physically. After all, he’s a busy dude, he has takeovers to plan and underlings to Force choke, he can’t be taking care of everyone else’s problems for them. It will be interesting to see how much Vader shows up in Rebels, if there is in fact anymore to be had. The action is set between the events of Revenge of the Sith and A New Hope, when the Empire is tightening its oppressive grip on the galaxy. That’s a timeframe when Vader is all over the place and at his most active, so it would make sense if he shows up from time to time, just to keep people in check and remind them that he’s around, trying to crush the burgeoning rebellion. Still, he doesn’t need to show up too much in order to make his presence felt. Just knowing he’s out there, lurking, being evil as all hell—this well before the Luke-I’m-your-father, feelings-having Vader—may be enough to ad an ominous air to the proceedings. The augmented “Spark of Rebellion” airs on ABC on October 26, while Star Wars Rebels airs regularly on Disney XD on Monday evenings.